Once you discover babywearing, you’ll want to Wear all the Babies! The benefits for Mom and baby are amazing. From keeping baby happy, to allowing Mom (or Dad) to eat with both hands; Babywearing helps meet the needs of everyone who surrounds baby. As the warmer months approach, baby will make trips to the pool, the ocean and maybe even through the sprinkler. What better way to celebrate wearing baby then with a fantastic warm weather #WearAllTheBabies Giveaway?! Have you ever heard of a water sling? BeachFront Baby is well known for being the water sling company. Developed by Mom to 4, Diane, these carriers developed from her need to wear her babies in the pool. Similar in size and function to ringslings and woven wraps, these slings are designed to go into the water and for babies 8-30 pounds! Made of polyester jersey mesh fabric, these slings keep baby safe, look great on Mom and go right into the pool or ocean. Can’t shower without baby? Take baby in with you in a water sling! Free Soul Designs has some of the most unique items on the market. 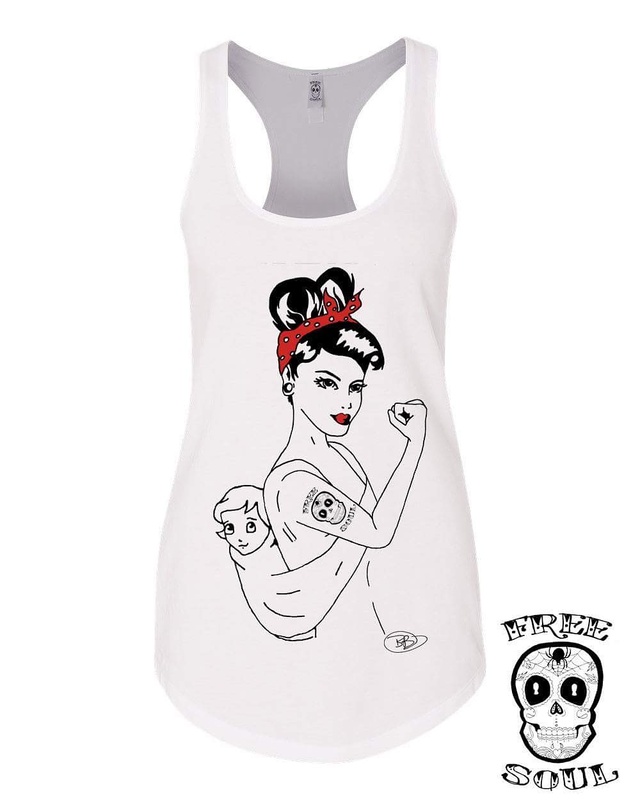 Their Badass Mama Series includes this badass babywearer tank that features art by Bailee Claire. With 15% of all profits going to a battered women’s shelter, this 50% cotton and 50% poly top is made with a touch of altruism. Launched in 2015, the company sets out to empower women while featuring freelance artists. They have long sleeves, short sleeves, tanks and even tops for baby! The entire line is made from original art and each design has uniqueness and style. What babywearing outfit wouldn’t be complete without babywearing fluff? Better yet, this cover was custom made and coordinates with the tank! Monkee Bumz is a WAHM shop offering IMO some of the most adorable custom embroidered fleece cloth diaper covers available! In addition to diaper covers, this shop based out of VA has hooded towels, gifts and children’s clothing. Find her etsy shop full of really great products and make sure to “heart” it to see new items as they arrive!. As soon as baby starts reaching…it seems like they find hair! Chompy Chic Chewlery gives baby something to do while being held in your arms or worn in a carrier. 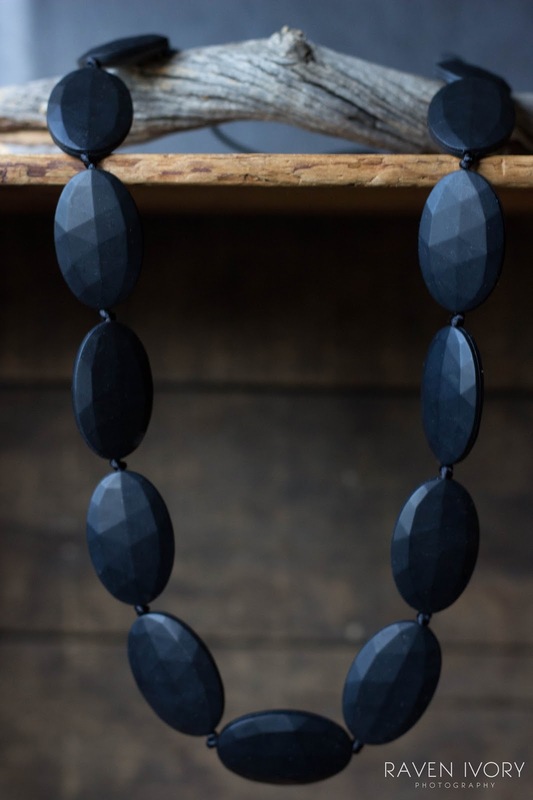 In earlier months, chewelry gives baby something to hold their visual attention, as they develop baby can hold the necklace or teethe on it and soothe aching gums. Babyweraing jewelry is both attractive for Mom and functional for baby. Chompy Chic has an etsy shop full of products including necklaces, baby carrier teethers that go right on the shoulder strap, bracelets, sensory needs, paci clips and even toddler jewelry. The winner of this prize package will have this beautiful necklace included! For the giveaway! 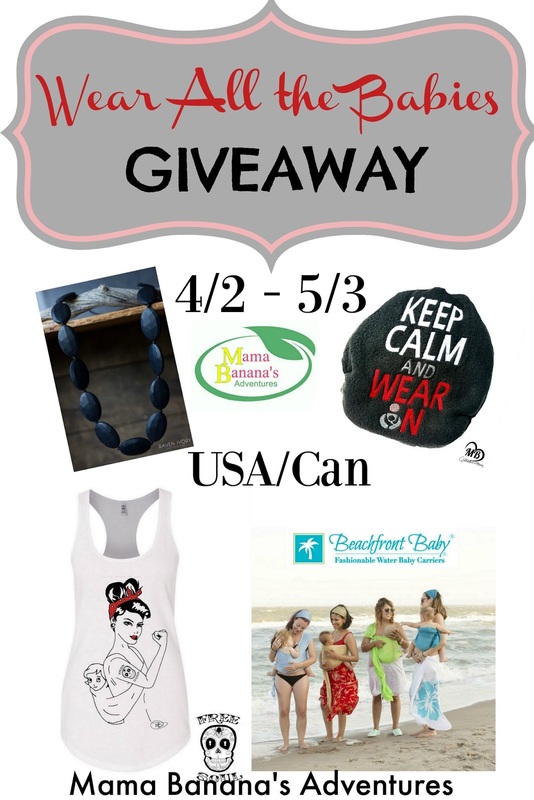 One lucky USA or Ca resident will win this prize package so they can Wear All the Babies! Enter using the GT form below and thank you for stopping by and visiting our websites. We really appreciate your time and “likes” for our social media accounts. Sponsors often determine which bloggers to work with based on these numbers and we love hosting events!! (Please pin the image below, it’s ‘pinterest sized’. ‘s Adventures at: MamaBananasAdventures@gmail.com or the blog that you are entering on.